These pages have been created to give web exposure to leaders of energy kinesiology. Dr. Sheldon Deal is a Chiropractor and Naturopath. 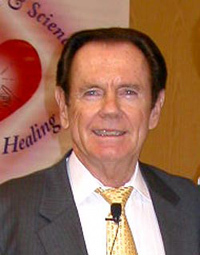 He first became interested in Kinesiology when he met Dr. George Goodheart in 1970. He was later asked to be one of Dr. Goodheart's Study Group Leaders and was one of the original group of physicians who later became known as the "dirty dozen". It was this group that went on to form the nucleus of the International College of Applied Kinesiology - (ICAK). Throughout his career, Sheldon has worked closely with Dr. George Goodheart and Dr. Thie. John Thie was the ICAK's founding Chairman in 1972 and served until 1976. Dr. Deal served as Chairman of the College from 1978 to 1983. Today, Sheldon serves as President of the ICAK Board of Examiners and the Technical Advisor to the Association of Specialized Kinesiology (ASK). Dr. Deal states that he always likes to collect the latest in research and findings over the years so that he could try them himself. Sheldon "the real" Deal travels the world sharing this knowledge.